WPL is pleased to exhibit the work from the Walkerville Artists’ Co-op (WAC) this month on our Community Art Wall at the Central Branch. The WAC is an art gallery, showcasing more than 35 artists, artisans and authors in Windsor, Ontario Canada. The gallery is run by its members as a true co-operative, and is now a not-for-profit organization. WAC runs many different types of programs for youth and for visiting artists, including a sculpture contest, annual members’ showcase, and many collaborative fundraising events. It’s members believe that all art is fundamental in society and that living with art and engaging with artists should be easily accessible to everyone. ​They would also love to hear from you as they are always open to new members. From painters and poets, sculptors and photographers, and just about everything else in between, their co-op offers a prime location to show what you’ve got! 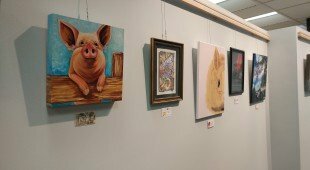 You can check out just a portion of their work on our Community Art Wall at the Central branch throughout all of October during regular open hours. Another fine addition to our history of exhibits.